"Stop my dogs from fighting!" That's one visitor's plea after adopting a dog into the family. 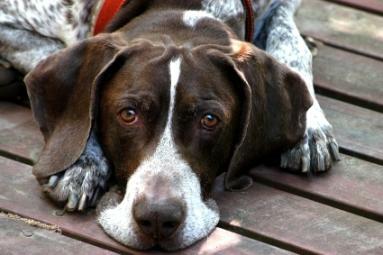 I have an 18-month-old female German Shorthaired Pointer named Mae. I've also recently taken in another female dog named Maury that I have previously cared for about ten times when her owner was away. My problem is that Maury has begun to attack Mae. I used to be able to walk both dogs next to each other, and now Mae walks behind Maury. Maury is obviously taking a dominant role, but I expected the tension to be at its maximum while they were figuring out who is dominant, not afterward. Last night I had to separate the dogs and force them to lay down next to each other until they were both in a totally relaxed state. They ate and slept within three feet of each other that night. This morning Maury attacked Mae again as I set their food out. These fights happen so quickly it's hard to catch them before they begin. Do I need to keep the dogs separated until I can get Maury under control? I suspect the fighting has something to do with me since they spend the day in the yard by themselves while I'm at work, and I've never seen signs of a fight. It only seems to happen when I'm around. I can't figure out what I could be doing wrong. Any ideas? I'm sorry the adoption of Maury has hit a rough patch. I think this must be a very confusing time for her being thrust into a new home and family, although I certainly commend you for adopting her. Maury's confusion is leading to the outbreaks of rage you're seeing, and unfortunately Maury is focusing that rage on Mae because she is subordinate to her. You have been spared because Maury views you as dominant to her, a relationship you established with her as her sitter. Let's talk about what you're doing right, and move on to other measures that might help the situation. First, putting Maury in a time out by making her lay down until she is relaxed is very good. This takes the fury out of her and reinforces your dominant role. It is not as necessary to do this with Mae unless she is actually becoming angry and fighting back. She has already taken on the submissive role, so forcing her into further submission will not help the situation unless she is participating in the fight. I think it would also be beneficial for you and Maury to attend a dog training class together. You should seek out a trainer who specializes in behavioral issues and is also willing to conduct some sessions with you in your home. This is where the main action is taking place, so it's good for the trainer to observe the three of you in situation. An experienced trainer will be able to pinpoint exactly what sets Maury off, whether it's you, a cue from Mae or something else. I hope you find these suggestions helpful and you're able to work the situation out.